Anodized aluminum body and securely locks provide maximum stability and safety while walking on any surface.Safely supporting up to 250 pounds.This folding cane can be collapsed in 4 interconnected sections,perfect size and easily put it into your tote bag, backpack, large purse, glove compartmentt. There are 5 additional length adjustment holes,5 levels adjustable height from 33 inch to 37 inch in 1 inch increment,providing a convenient option for those needing assistance of a cane.Comfortable contoured wooden handle has an ergonomic design to fit the shape of the palm and relieve pressure from wrist. 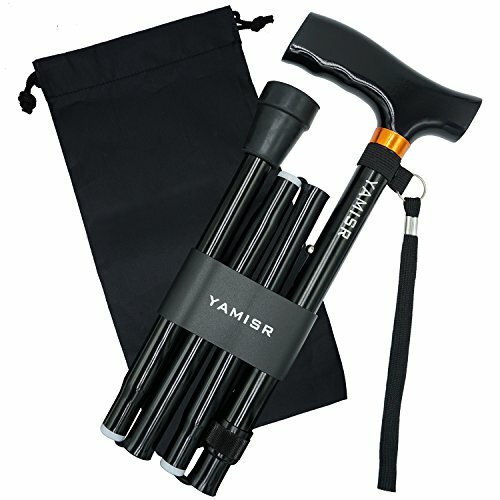 ★Sturdy & Safety - This folding cane has an anodized aluminum body provides maximum safety and a rubber tip at the bottom with some traction so that the cane does not slip in if you are on wet pavement.Contoured wooden handle has an ergonomic design to fit the shape of the palm and relieve pressure from wrist. ★Collapsible & Portable - This folding cane can be collapsed in 4 interconnected sections when not using it.It's the perfect size put it into your tote bag, backpack, large purse, glove compartmentt. ★YAMISR GUARANTEE:One year refund/ money back/ replacement warranty and lifetime service are offered. So you can purchase it with confidence now.To ensure you purchase the authentic products which come with hand strap and carrying bag,only purchase from YAMISR,Refund and exchange service is limited to all purchases from YAMISR. If you have any questions about this product by YAMISR, contact us by completing and submitting the form below. If you are looking for a specif part number, please include it with your message.